Barrix Argo Science successful in reducing farmer spend in pesticides using alternatives. Find out how ? About a year back, Reddy was struggling to make his ends meet. The change in his fortunes was brought about by using pheromone traps for monitoring fly pests from a Bangalore-based company called Barrix Agro Sciences. ”. 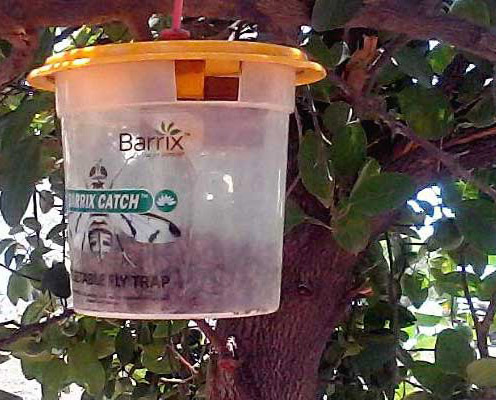 Barrix pheromone traps attract the pests and the pests are drawn to the trap instead of the crops. Reddy is one among the 15000 farmers who use Barrix products in Andhra Pradesh, Tamil Nadu and 16 districts of Karnataka. “We are getting good response from farmers”, says G Srinivas, a Govt agriculture official in Andhra Pradesh. He said that the loss in mango yields with pheromone-trap protection has reduced by 50%. “Instead of treating the symptoms, we eradicate the root cause of the problem”, says Lokesh Makam, the 37 year old founder of Barrix. An MBA in pharmaceuticals, he has worked in Ranbaxy, Dabur and Himalaya earlier. He started this company with his personal saving of Rs.23 lakhs along withMayil Vagnan. According to Govt. statistics, pests destroy Rs.120,000 crore worth crops every year and Rs.35000 crore is spent on pesticides for crop protection. The cost per hectare works out significantly cheaper than pesticides. Moreover, they are not dangerous and do not contaminate groundwater and soil. Barrix co-founder, Vagnan, aged 40 was employed in major pharmaceutical companies like Cadila Pharmaceuticals and Ranbaxy before entering the agricultural sector. Apart from protecting fruit and vegetable crops, Barrix protects crops from fungi and bacteria with a microbiostat product. In addition to the domestic market, expansion plans to America and Europe are being made. The company is expected to receive 200 crores investment in the next five years.